The Function Ultralight Ski Carry Strap is super cool and unlike anything we've ever seen! This ski carry system is a super minimalistic and folds up small enough to fit into your pocket unnoticed. This product fits a perfect niche between carrying your skis by hand and carrying your skis with a dedicated backcountry backpack. Until now, there was no convenient way to carry your skis for short backcountry, side country, or slack country hikes. The Function Ski Carry Straps are not only good for the backcountry but are also perfect for the resort. Got a long walk to the parking lot? Got a lot of gear to carry and want to free up your hands? These straps are perfect for situations like these at the resort. The Function Ultralight Ski Carry straps are made from a top quality nylon webbing. Additionally, the straps feature a cut-proof Hypalon edge protection so that your sharp ski edges will never cut the fabric. The entire strap system only weighs 84 grams and folds up into a magnetically sealed Tyvek stuff sack. This means it is small enough and light enough to keep in your pocket unnoticed for a day of riding! Using the strap system is really easy with its single buckle assembly! Function is an up-and-coming ski and snowboard bag manufacturer out of Colorado, USA. With only a few years of business under their belts, Function has already received the highly coveted "Editor's Choice" award for their backcountry backpack in Freeskier magazine. This is an impressive feat that demonstrates just how special Function products are. What sets Function apart from others is their attention to detail and unwavering desire to build bags out of only the best material. Every Function bag is a product of countless hours of research and testing by avid backcountry enthusiasts. Can I use this over my CamelBak? Our UltraLight Ski Straps are designed to carry the skis directly on your back, the way the strapping system works; it may not be easy or work right to position them over your backpack securely and comfortably. It is possible it could work, but it might be a bit awkward to get them positioned right over the pack - so we can't guarantee it will work or will work well, because of the way the straps are designed. We have a video link posted in case that gives you a better idea and some set-instructions online for checking out. 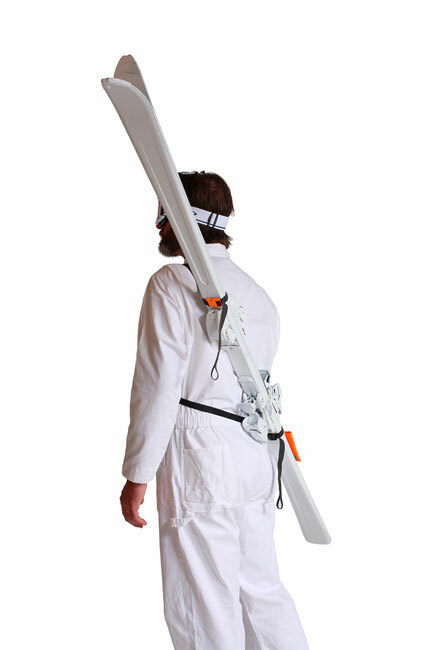 With the ski carry system, can you switch sides of your shoulder with the shoulder strap and/or skis? You can switch between each shoulder, you just need to pull the chest clip around to the other side. Easy to use and exactly what I was looking for. At first glance I thought the straps seemed flimsy but they are plenty strong and the key one (that goes over your shoulder) is sufficiently wide to disperse the weight, particularly if you’re wearing a fleece or jacket. And the thin straps are important to make it very compact and lightweight - which it certainly is. I also value the use of clips on the loops that hold your skis; competing products use Velcro which I feel is not as secure and which loses effectiveness over time. Only reason it didn’t get 5 stars is that I think it’s a little pricey. This is an incredibly well designed ski harness. Its simplicity is genius, and the how-to video is great. The little bag that comes attached is perfect for stuffing the straps in before the descent. The only cautionary comment I have is not related to this product itself. I worry that in a steep uphill climb with this strap, if one were to fall or slip, the strapped on skis might present a safety issue on the slide down. When I have used it, it slides off my shoulders. Once I start moving, it is a little better. I'm pleased at how small and sturdy it is. I do not know how it would fit many women well on the front side. I am glad I can wear my backpack over the top. Don't wast your money on fast shipping. I placed the order on Jan 16 and made sure the item was in stock. They did send it out until three days later and it still too 6 more days. I did not get to use it on my trip but did check it out and it is a good way to carry. This company stands by their equipment.! A buckle on the strap broke. I understand equipment malfunctions can happen. Within days I had two complete replacement straps, even though I had only requested a replacement buckle. Now my husband and I both use this strap to carry our tele skis up the hiking terrain at Taos Ski Valley. Easy to use, lightweight and packs into my jacket pocket.